Did you know that you can win prizes on Snapchat? You will find giveaways on every social media network and now you can also win on Snapchat too. Snapchat was designed to use between two or more people to send private images or videos. It was originally popular among tweens and teenagers but today it has grown into a worldwide sensation with even the White House getting in on the fun. Not only can you send private “snaps” to your friends and family, you can follow big brands, celebrities and even Sweeties Sweeps to see what they are up to. If you like watching reality TV you will love Snapchat because your favorite people, brands, sports teams, politicians and more can be followed in real-time. There is no waiting for next week’s episode to see what your favorites are doing; you can keep up with them as the action happens. Companies large and small, bloggers, YouTubers, Vloggers, and now Snapchatters give away cash and prizes everyday of the year on social media networks (Facebook, Twitter, Pinterest, Instagram, YouTube), blogs, websites, and now Snapchat. To win on Snapchat you may have to view someone’s snaps to see if they are hosting a giveaway and find out what you need to do to enter. This means you will need to own a smartphone or tablet because Snapchat does not work on a computer. 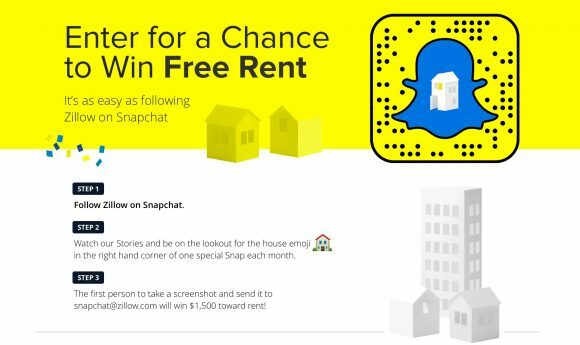 Sometimes Snapchat may be used as a “bonus” entry if the blogger or company has an existing giveaway and wants you to follow them on Snapchat. Other times Snapchat may just be used to share a secret code or hashtag that you need to enter a giveaway on a website or blog. To enter a giveaway on Snapchat, you need to learn exactly what a snap is, where to view snaps, how to create a snap in case you are asked to make one to enter a giveaway on Snapchat, and where to find private chats in case you are notified about winning a prize. You may also be asked to send a screenshot as your entry so you will need to learn how to take screenshots. You can only use Snapchat if you have a smartphone or tablet and by downloading and installing the free Snapchat app. You must be at least 13 years old to use Snapchat. What is a Snap: A snap is a single image (photo) or video that you take and send through the Snapchat app. They call it a snap because you use your phone or tablet’s camera to “snap” the photo or video. How Long Do Snaps Appear: Each snap can last from 1 to 10 seconds but no longer than 10 seconds. Each snap will only be available on the Snapchat app for 24 hours and then will drop off. Deleting snaps (images and videos) is Snapchat’s default setup and there is no way to change it. You can save snaps by taking a screenshot it but it won’t work to save videos. How to see Someone’s Snap: From the home screen swipe to the left and tap on the person’s name. Their snaps will load and you view everything they have posted in the last 24 hours. If they go too fast you can view them again at the bottom under All Stories. Watch my video to learn how to use Snapchat. Grab your smartphone or tablet and follow along. It’s easy to follow me on Snapchat. Get my book if you can’t figure it out but if you know a bit about Snapchat do this. Open Snapchat, position your phone over the snapcode tap the screen until Snapchat recognizes the code and you can tap Add. If that doesn’t work you can tap the camera button to take a photo, add friend and then tap the X at the top left to cancel the photo so you don’t save it. Once you follow me just open Snapchat, swipe to the left and look for my name, tap on it and my snaps from the last 24 hours will load. Each snap (a photo or video) lasts from 1 to 10 seconds so they go by quickly but you can replay them over and over until they expire and go away. Get my book and learn how to take a screenshot so you can save important snaps. Snapchat is not like any other social network you are used to. It is not like Facebook where you see an endless stream of conversations, images, and videos. It’s not like Twitter with fast moving text, images and videos. It’s not like Pinterest with beautiful photos to view, pin and save. It’s also not like Instagram with a stream of photos and videos. There is no way to find anyone or anything on Snapchat because there is no Search feature. If you don’t know someone’s user name or Snapcode it is very hard to find or add someone to Snapchat. There are no hashtags on Snapchat. 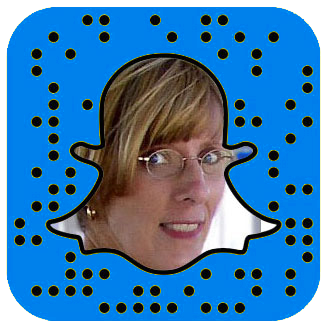 Snapchat tends to be very hard to learn because it is so different and not intuitive at all. Get My Book on Snapchat for Free! 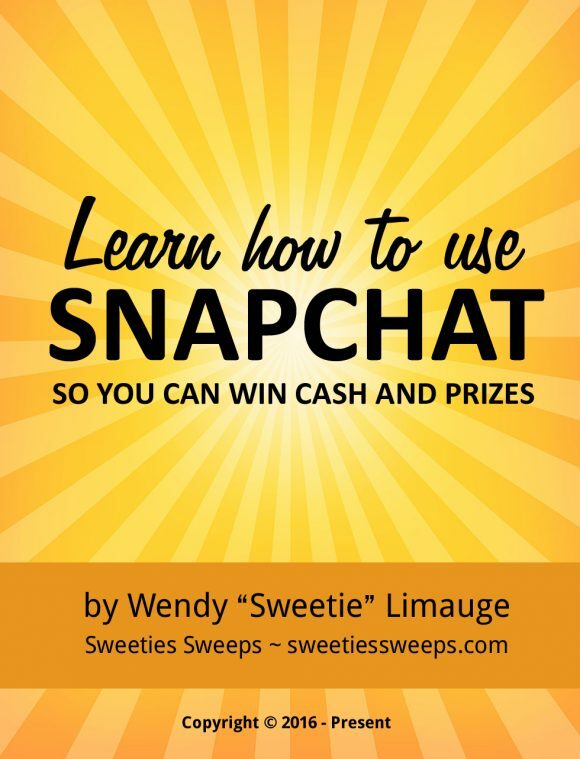 Because Snapchat can be so confusing to learn, I wrote a book that includes everything you need to know to setup a Snapchat account, create snaps and add text and stickers, how to make text white or black on your snaps, how to send a snap to your friends or everyone, view snaps and snap stories, reply to snaps, get notified if you win a prize, how to view other people’s snaps, save your snaps, how to screen a screenshot, find private messages, how to block someone, find your Snapchat score, how to personalize your Snapcode, how to stop Snapchat from eating up your data plan, and even how to use those fun Snapchat filters. Sign up here and you will get my Snapchat book for Free! Maybe you think real people don’t actually win sweepstakes. Sweetie will teach you how to enter legitimate sweepstakes, watch out for scams, and show you that real people DO win prizes everyday through sweepstakes. This Free eBook will teach you how to win, protect yourself from scams, and be on your way to becoming a Super Sweeper! The weekly lessons will teach you everything you need to know to become a winner. There is never a charge for this course and you may unsubscribe at anytime. Fill out the form below or Click Here to your Sweeties Sweeping 101 eBook for Free! Will I get junk mail if I enter sweepstakes? Do I have to give out my real information to enter sweepstakes? Do I have to pay taxes on sweepstakes prizes? Thank you. I purchased the booklet. Thank you for explaining Snapchat!